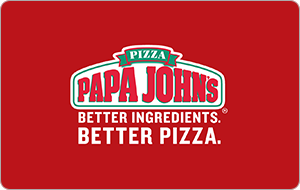 Get Better Ingredients, Better Pizza when you use a Papa John's Gift Card. It starts with our Better Ingredients, like our fresh, never frozen original dough, all natural sauce, 100% real meats and fresh-sliced veggies. And, we think you'll taste the difference, because "Nobody does what Papa John's does." Your use of this card constitutes acceptance of the following terms and conditions: The amount contained on this card may be applied toward the purchase food, beverage or gratuity from any participating Papa John's restaurant. Verification may be required if the card is used other than by physical presentation (such as telephone or on-line ordering). If the card is lost, stolen, damaged, destroyed or used without your permission, it will not be replaced or replenished and you will lose any remaining value on the card. This card is not redeemable for cash, except as required by law.